The Compulsive Reader: Writing Contest for Teens! Hi everyone, Daniel Nayeri here. 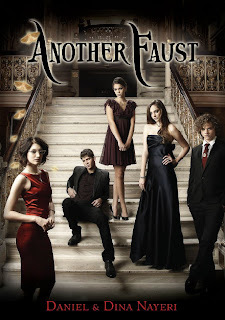 Dina and I are about to kick off a month-long tour for our book, Another Faust, and we want to do it by announcing a contest! We are looking for the most promising writers out there (that’s YOU). And then we want to showcase their work, so that all of the Internet can bask in their awesome writing might (and, you know, give them prizes). We want you to write your own short story, re-imagining of the Faustian Bargain. (For inspiration, check out Bedazzled, Simpsons “Tree House of Horrors IV,” and The Little Mermaid). It can be about anything you like (but let’s keep it PG-13, and under 3,000 words), and it’s open to everyone. All you have to do is send your entry to dviergutz@gmail.com before January 31. Make sure to read them so you don’t get DQed! Though we’ll feature the top five on our site for comments, the judging WON’T happen by popular vote (so basically, we don't care which contestant has the most friends). Dina and I will personally read them. So, spread the word! Tweet, retweet, forward, thread, spread, embed this post. What a fun contest! I'll file this for later consideration (and possible participation). Great idea!